One of our most beautiful vacation cabins conveniently located just outside Helen, on a private paved mountain road with beautiful views of Yonah Mountain. This luxury vacation cabin is the perfect accommodation for three couples, a family of 6 or small group. Enjoy the upper deck with views across the Blue Ridge mountains and the outdoor fire pit for evenings of entertainment and relaxation. The top floor is reserved for the private master king suite, offering the best mountain views in Helen, all of which can be seen without ever getting out of bed! The adjoining private bath includes both a shower and step-in jetted tub. Sliding doors lead out to your private covered balcony deck complete with wooden rocking chairs. 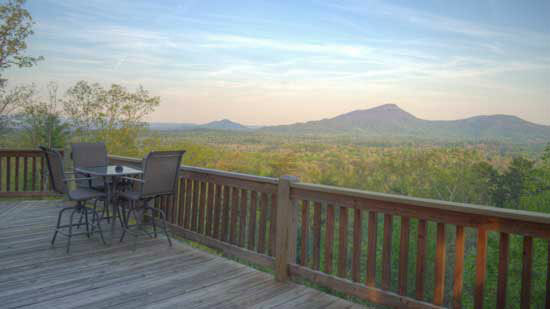 A wonderful spot to relax or gaze at the incredible mountain ranges day or night. The open main level floor plan is perfect for the family to gather and dine. The 2nd king bedroom with private bath, also on the main level, is perfect for early morning risers or those who love a midnight snack without the stairs! Step out to the screened deck that spans the entire back of the main floor, with outdoor seating, dining and grill area. The lower level includes a large gathering room with regulation pool table, TV and bar area on the left side, with a full hallway bath and the 3rd Queen bedroom on the right. Step out from the gathering room to the lower deck with hot tub, and a large back yard with stone path leading to a gorgeous flagstone fire pit for the whole family to enjoy! Once you experience this home, you will never want to leave. Yonah Vista is within walking distance to Serenity Cellars and is located within an entire region of local wineries. We loved our time in the cabin. The location was perfect, the cabin was lovely and just right for our family. The fire pit, especially, was a big hit with our children! We will definitely stay with Pinnacle the next time we visit GA! The team was great and very helpful! We will definitely stay at the property again! Great experience - imformative and helpful! Great stay and hope to be back this summer! Thanks for always being so friendly and welcoming! It is a pleasure to rent from you! A place to ENJOY! with family or friends that will leave memories of a fun and joyous trip. 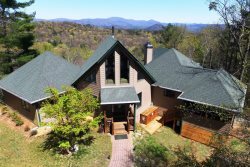 Yonah Vista is a beautiful cabin, loved our stay, very convenient to Helen, will be using Pinnacle again for our vacation needs. Very relaxing stay. Very beautiful cabin and beautiful views. One word GREAT!!! Ashley was a pleasure to work with. She would always reply to our e-mails. And when we ask her about early check in, no problem. I look forward to working with Ashley and your team in the furture. My wife and I we have this on our bucket list. And the property was just what we thought it would be A GREAT TIME!!! Very clean, everything well stocked. The fire pit was a way of showing our grand childern what smors are. The hot tub was very relaxing. And to the good lord above the most beautiful weather for Christmas. The only contact we had was in making the payment, but it was easy and I loved that we could just show up and everything was ready for us. They were very helpful and kind. We had such a good time. The property was beautiful and it was perfect for what we needed. It was close to anything you wanted to do, had hiking trials nearby, and wonderful wineries. We will definitely come back! This is the third time we have stayed with Pinnacle. The staff is extremely friendly and easy to work with. We don't even bother looking at other rental sites, we go straight to Pinnacle! We had a lovely visit! The cabin was beautiful and we just loved the view. We had as much fun staying in the cabin as going out into Helen! Beautifully maintained home. We have rented from two other local companies, pinnacle is by far our favorite! relaxing and peaceful. Property was well kept and maintained. When I had to call everyone was very helpful and friendly. Loved the fire pit at this property! A beautiful place, well maintained with an excellent view.